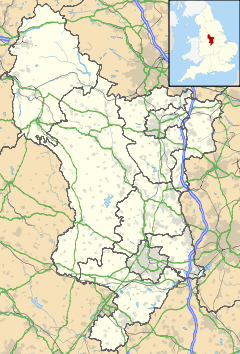 Sheldon is a village in the Derbyshire Peak District, England near Bakewell. It is best known for being the closest village to Magpie Mine, a lead mine with an engine house built in the Cornish style. Lead mining flourished around here in the 18th and 19th centuries. It is now scheduled as an ancient monument, and is the most complete example of a lead mine remaining in the Peak District. It is about 1050 feet above sea level. Sheldon is home of the Church of St Michael and All Angels as well. The church was erected in the 19th century with material derived from dismantling the former Chapel of Ease. The parish church is dedicated to Saint Michael and All Angels. Some sources give the dedication as just "All Angels" and many sources refer to the church as just a chapel. The present church, which seats 140, was built in 1864 near the site of the old chapel. The burial ground is to the east. Sheldon is too small to have a parish council so administrative matters are dealt with by its parish meeting, formed from village residents as well as the elected chairperson. Sheldon has a small population of approximately 80 people according to the 2001 census. Sheldon used to have its own monthly magazine but since 2010 the magazine has merged with the Ashford Parish church magazine. A local history group, covering the parish of Sheldon, was established in 2007 by several residents of the village. The group meets every month throughout the year (with the exception of July and August) at the Hartington Memorial Hall. Recent work carried out by the group includes recording the oral history of several elderly members of the village, assigning ancient field names to modern field numbers, and the funding of a display cabinet for the presentation of archeological findings. The history group has recently won a sustainable development fund grant, provided by the Peak District National Park Authority, to assist with the production of several historical projects and the purchase of new equipment. The Sheldon Duck is a duck-like peridolia found in an Ash tree, which was felled at the beginning of the 20th century. According to local legend, in the early 1600s villagers saw a duck flying into an Ash tree, but they never observed it leaving the tree. When the same tree was felled, approximately 300 years later, a duck-like pattern with markings of the brain and lungs were found in the resultant timber boards. The boards were on display in Ashford in the Water Post Office for a while and postcards showing it were sold. Later, the timber merchant who felled the tree used these boards for making a mantlepiece at his home. ^ "2001 Census (archive.org copy)" (PDF). Archived from the original (PDF) on September 24, 2010. Retrieved 2010-09-24. ^ "GENUKI: Sheldon, Derbyshire". Retrieved 2014-10-29. This page was last edited on 12 May 2018, at 19:47 (UTC).